Please enjoy these links that explain the different aspects and functions of professional management (City Manager/ City Administrator Forms of Government). 2. Key Facts about Professional Local Government Managers. 3. Description of five forms of local government in the US. KingstonCitizens.org Upcoming Educational Panel in the Kingston Times. 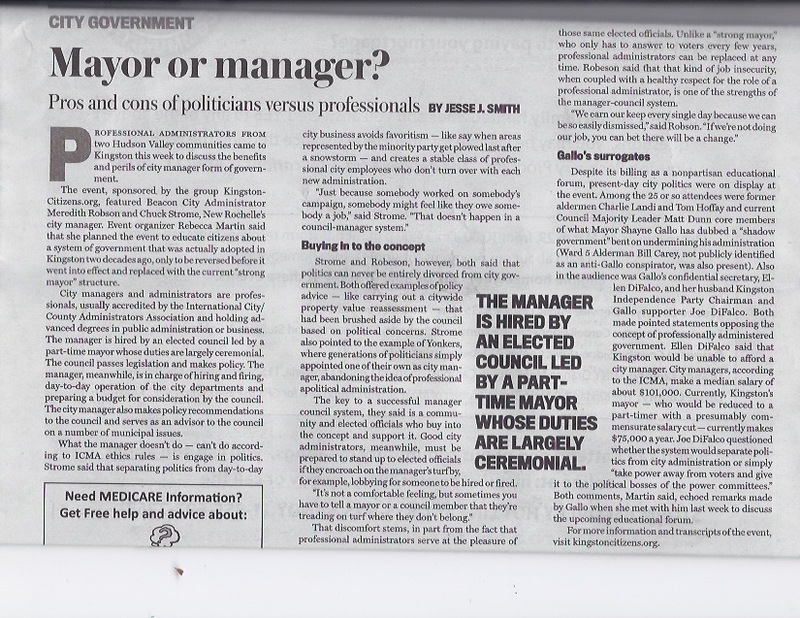 Thanks to the Kingston Times for their article today on the upcoming ‘educational discussion’ that features information on City Manager and City Administrator forms of government. To clarify, this opportunity IS NOT A DEBATE as written in the article. Our efforts are to offer the public a chance to learn about Beacon, NY’s City Administrator form of government (City Administrator/Mayor/Council) and New Rochelle, NY’s City Manager form of government (City Manager/Council). SPREAD THE WORD: Download Flyer for Educational Series and Share. Help KC.org get out the word on its upcoming public informational event. Please print and share this flyer. Help more of Kingston Citizens to be in attendance! Back in 2006 a group of citizens in Ward 9 started informal meetings for those living in the neighborhood to help educate and inform citizens on relevant topics in Kingston. It was a reaction to wanting to better utilize our alderman, who at the time was Mike Madsen, and our aim was to inspire more citizen input to help him to make decisions on our behalf. Long before Facebook and Twitter and an onslaught of social media as a way of communicating. Later on, we created this blog. In 2007 to be exact and since that time, it’s been a whole new ballgame. Its primary role was to create a place for our work in the ward, to encourage other wards to hold discussions online throughout the city and to nurture more citizen journalists. With all the different sources today, there is still nothing better than face to face communication. Blogs, social media and that sort of thing are fine, but can be partial to an individual’s point of view. Who is the author? Supporters? Dissenters? Lurkers? KC.org retired a few years ago, but is now reinstated because there seems to be a need. In light of transparency as we work to accomplish our ‘face to face’ with upcoming educational forums in a nonpartisan way, we have met with many elected officials and volunteers past and present. We plan on meeting with the Mayor, too, to discuss this work and to get his feedback. That’s the beauty of KC.org. No matter what ones personal views are on the issues or on the current colorful personalities on the scene today, it’s a refuge to fall back on so one can focus on education, consensus and ultimately change. Are you interested in this work? Don’t be shy. Get in touch. We’ve got a job for you. No matter how busy the Mayor’s office is today, a “State of the City” address isn’t an elective. It’s an obligation. 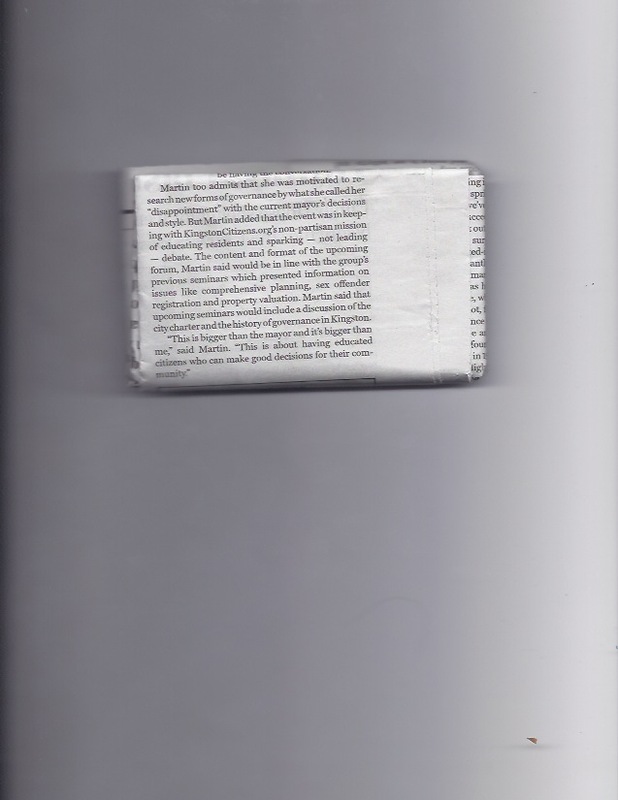 …and no matter how sympathetic to the Mayor one may be (and in all fairness, I am – as I think it’s far too large a job for only one person – hence, my desire to learn more on City Manager/City Administrator Forms of Government), it may not be legal for an elected official to not follow the charter as written. That certainly should be looked into. Have a look at “Revising City Charters in NY State” and read the introduction and history of this important document. The charter is “the basic document that defines the organization, powers, functions and essential procedures of city government. It is comparable to the State Constitution and to the Constitution of the United States. The charter is, therefore, the most important law of any city“. The city of Kingston’s Common Council, on the other hand, has its own set of rules outside of Kingston’s charter. 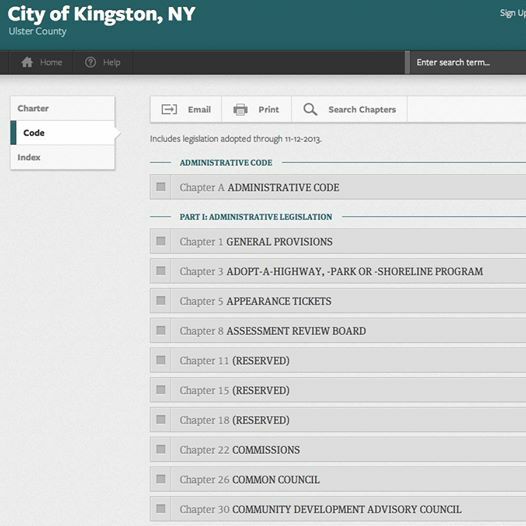 The “Council Rules for Government” is a document that is not currently available on the City of Kingston website (as far as I can tell, and it should be accessible to the public in the same way the Chater is). I am happy to have received a copy and to make it public here. What does that mean? If one alderman decides to vote ‘no’ (as what did occur last week with Ward 2 Alderman Brian Seche), the entire opportunity for the public to hear from their council majority/minority leaders is thrown out the window? Maybe now is the time to look closer at these documents. The public should take the time to read and get to know both the charter and the council rules so that it collectively understands how its city works from the inside out. 1. OUR MAYOR: Write and call the Mayor’s office and request that the law be respected, and that the annual ‘State of the City Address” be delivered. 2. MAJORITY/MINORITY LEADERS: Write to both our Majority Leader Matt Dunn (Ward 1) and Minority Leader Deb Brown (Ward 9) in support of their performing a ‘State of the City Address” whether it be official, or unofficial. 3. ALDERMAN-AT-LARGE JIM NOBLE: Write to Alderman-at-Large Jim Noble and ask him to explain the meaning behind the rule that requires a vote for our Majority/Minority leaders to speak to the public annually on the State of the City. If a vote is necessary, then ask that the council take up the “Council Rules of Government” and change the ‘unanimous’ to ‘majority’. Given what happened last week, it’s astonishing that one single vote can derail this opportunity for citizens.